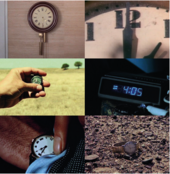 Christian Marclay’s internationally celebrated 24-hour video installation The Clock arrives at Tate Modern for the first time. The public are invited to experience the work for free during gallery opening hours, as well as at additional 24-hour screenings on Saturday 6 October, Saturday 3 November and Saturday 1 December. The gallery will stay open overnight on Saturday 6 October, Saturday 3 November and Saturday 1 December to allow the 24-hour film to be experienced in full. The Clock is accompanied by a programme of talks and events exploring themes related to the work, as well as a newly commissioned podcast. For press information contact kitty.malton@tate.org.uk or call +44(0)020 7887 4906. Images can be downloaded from Tate's Dropbox. How are artists, musicians, writers and film-makers experimenting with narrative form?